Now that the Qatar Masters Open has the crown of the strongest open in history, the London Chess Classic is trying to reclaim the strongest tournament from the Sinquefield Cup. Two years ago, the London Chess Classic boasted four 2800-rated players, but last year was even stronger with Magnus Carlsen and Levon Aronian headlining the six-player field. 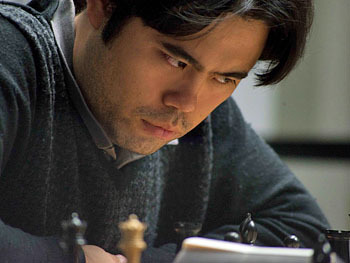 Neither will be at this event, but Fabiano Caruana will join returnees Viswanathan Anand, Vladimir Kramnik will challenge defending champion Hikaru Nakamura (pictured below). Anish Giri and Mickey Adams close out the list of the strong field. 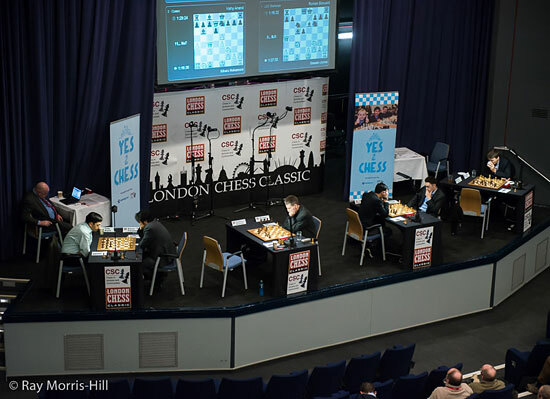 Chess in Schools and Communities (CSC) has announced the 6th London Chess Classic which will be hosted from December 6th-14th at the Olympia Conference Centre in Kensington, London. The initial event is the Super Rapidplay Open on 6-7th December with the prize fund of £25,000 (US$38,920). There is a new format as IM Malcolm Pein continues to innovate to reach a critical mass. The Super Rapidplay is a 10-round FIDE rated open with all players playing in the same section and competing for section prizes. 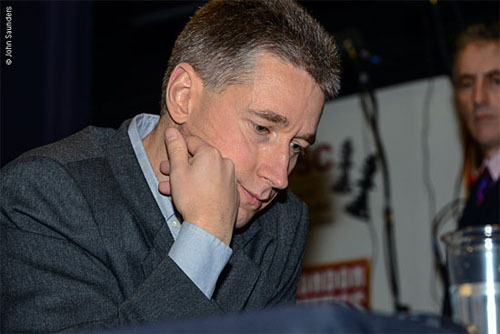 The six GMs competing in the London Classic will participate in the single round-robin rapid format at 25m+10s and the blitz event in 4m+2s increment. The classical event is 40/2 with 15m+30s increment. The “Sofia Rules” will be enforced such that no draws will occur in the first 40 moves. The tournament will adopt the football scoring of three points for a win and one point for a draw. 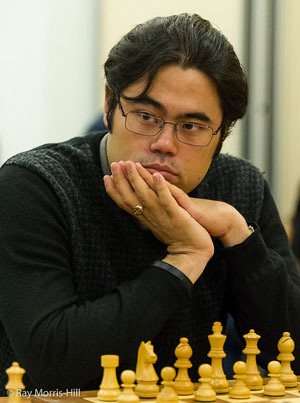 Nakamura, Adams win London CC Rapid Blitz! Hikaru Nakamura ran roughshod in the Rapid event which featured an interesting format of the top six players pairing up with top English junior players. There were a couple of scares and Nakamura tossed a piece early against a 2100 player Donny Muter, but complicated matters and ending up winning. Actually Anish Giri was head-to-head with Nakamura winning six in a row (again) before meeting and losing to the American. He closed out with two wins and 8.5 points (on +7) … usually enough to win. 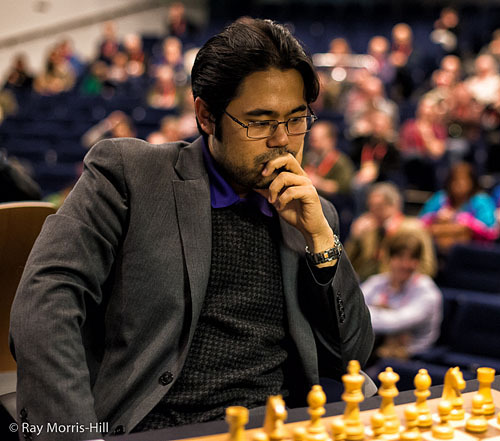 However, Nakamura (on +9) gave up a measley draw to GM Aaron Summerscale and closed out with wins over Michael Adams, Giri, Fabiano Caruana and Viswanathan Anand. Good win for Nakamura worth £8,000. Nobody expected Adams to put up numbers in blitz… except him. Michael Adams is a non-descript player who gets little fanfare in the media. Known for his simple style, many overlook the fact that he is a phenomenal blitz player. He put his skills on display by winning the Elite Blitz tournament. The format was an interesting double round-robin of ten rounds. The usual suspects were also in the running… not Caruana or Anand. Both had disappointing results, but Caruana also derailed Adams. Nakamura had a chance to sneak to victory with a draw against Vladimir Kramnik, but lost in an impressive game by the Russian. Absolutely putrid. However, sharing first is always good regardless of the quality. Classic photo… classic champions! Photo by John Saunders. Giri played energetically against Adams and was rewarded. Round #3 action at the London Chess Classic! The race tightens as Nakamura wins… Giri-Kramnik finale on tap! Nakamura scores… Giri-Kramnik finale on tap. The American can still win if he wins and Giri-Kramnik is a draw. Photo by Ray Morris-Hill. Anand wins 2014 London Chess Classic winning with black! 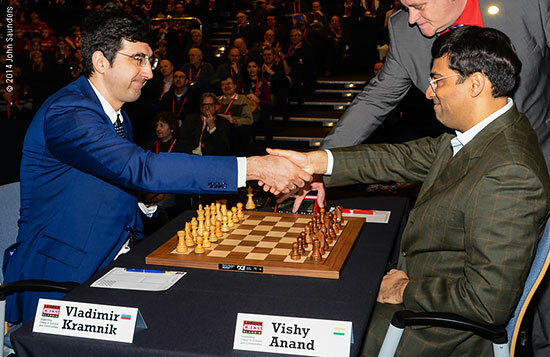 Viswanathan Anand won the 2014 London Classic by pipping the field in the last round. 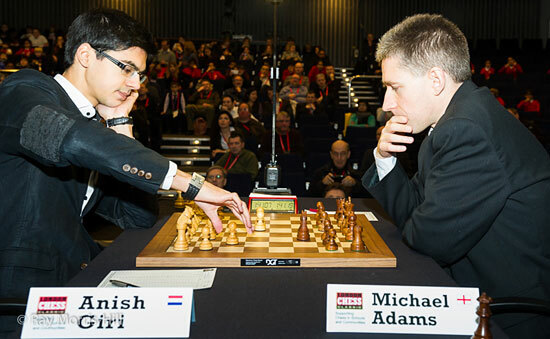 Anand’s win over Michael Adams gave him a joint tie for 1st on 7/15 points (or 3/5 conventional). His victory is by the virtue of him winning with the black pieces. 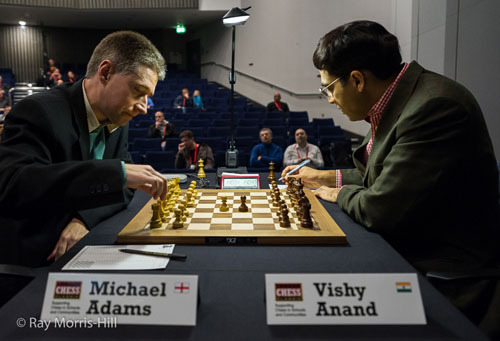 Michael Adams – Viswanathan Anand, 0-1. The classical tournament concludes a week of event including a rapid (won by Nakamura), blitz (won by Adams) and the classical (won by Anand). There was also a Pro-Biz Cup which paired the GMs with a business professional as part of a team tournament. This innovative tournament was won by Anish Giri and Rajko Vujatovic. IM Malcolm Pein’s initiative is designed to aid his Chess in Schools and Communities (CSC) and featured a number of events open to the public. The Gawain Jones-Romain Edouard six-game match was taken by the English player who won the opening game and held thereafter.